Description: Going on a picnic or to a cookout? Take a Sugar Baby watermelon along! They are a smaller variety and fit in the refrigerator pretty well. They are ready to pick when the rind is almost black. When you cut into a Sugar Baby, you will be greeted with sweet, juicy, red-orange flesh. They do have small dark brown seeds similar to apple seeds. Plant after danger of frost has passed. Side-dress with nitrogen when vines begin to run. Watermelons mature in 80-100 days from seed (Sugar Baby – 85 days). Young transplants are typically 14-21 days old. Sugar Baby melons average 8-12 pounds. Height: Grows 8″ to 10″ tall. Outstanding Features: Smaller and fits in the refrigerator better. Tips: Fertilize well and keep soil moist at all times. Placing a straw matt under the watermelon will prevent the bottom of the watermelon from rotting as it continues to grow. 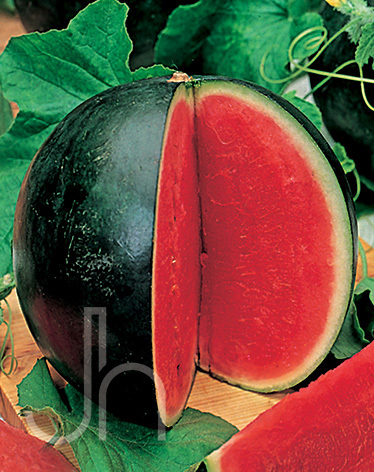 Click here to buy Sugar Baby Watermelon direct from www.buygardenvegetables.com.